When there has been an expected or unexpected death of a loved one, it is natural for adults to forget that children may be confused.The emotional reactions among family members may range from crying and hysteria to laughing. Children will know that something is out of sync, but they may not have the life experiences to put the bits of information they get about this major event into a concrete idea about what death is, and how to respond to it. They may imagine that something that will threaten their safety and security has happened. “This is one of the most difficult questions to answer and one of the questions parents most dread,” she writes. “How do you explain death? I like to turn this question around and ask the child, ‘What is life?’ Recently I was working with a group of children and their parents who were concerned about the murder of a young neighborhood girl. I started to explain death in this way: ‘I am alive,’ I said. ‘I can breathe.’ With this idea in mind, we went around the room. Children may have trouble processing what death is and that it is permanent. Even if the death has been a parent or sibling, they either become frightened that they will die or assume that while it is sad, it can never happen to them. Death is a complicated experience for anyone, whether young or old. Many people have told me that the way they first experienced the death of a loved one as children colored their experiences with death for the rest of their lives. My goal in this book is to help all caring adults help children through their first experiences of true loss so that they can cope with death, loss, and grief with resiliency throughout their lives. Children will need a familiar structure to their lives after their loved one has died because so much else of their life has been upset, and so many things are happening around them. The more you can keep them in their normal routine, the easier time they will have in coming to terms with the loss of a loved one. Remember that separation is the underlying pain of a grieving child. If a child is old enough to love, he or she is old enough to grieve and miss the person or pet they loved. Their main concern, as it should be, is their own safety and security. They will want reassurance that they will be taken care of and that their needs will be met. The information contained here will be part of an important new book coming soon from www.ArtichokePress.com on explaining death to children. Stay tuned for more information on this book! 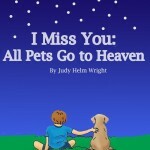 We also have a wonderful picture book for young children available on Kindle and Amazon called “I Miss You: All Pets Go To Heaven” that is written to help stimulate a conversation about death with children. It is also specially for mobile devices, so you and your child can read it together and have a discussion. You will be glad you did.